Ivory 232 Pyramid 1956 siemans telephone. supplied with 64D bellset, due to this type of telephone was not fitted with internal bells. fitted with with cheesedraw. original cordage and junction box. 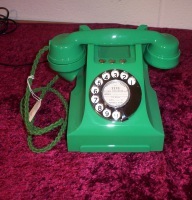 Very nice example of a period telephone. No cracks or damage. Any questions please ask. £435.00 including postage within UK. We will ship overseas however please contact for your countries shipping rate. Black Bakelite 328 telephone with functional bell on/bell off buttons. Factory refurb in Wales 1966. Very nice example of a sought after telephone. No damage complete with original cordage. This telephone is in full working order, has been refurbished throughout. £280.00 Including free postage within UK. Black 232 Pyramid telephone refurbished 1961 supplied with 64D bellset, due to this type of telephone was not fitted with any internal bells. fitted with with cheesedraw. original period cordage . 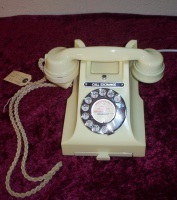 Nice example of a period telephone has little sun browning though no cracks or damage. Price is £220.00 including postage within U.K.